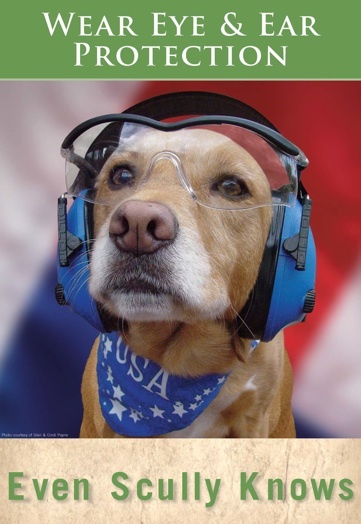 Eye and active (electronic) ear protection is mandatory during live fire exercises. Never let the muzzle point at anything you are not willing to see destroyed immediately. Keep your finger off the trigger until you have made a conscious decision to shoot. Always positively identify your target . . . . . and everything that is behind it and around it. Empty chamber indicators (ECI’s) must be used in all uncased firearms when not in actual use. Cell phones/electronic communication devices are never permitted on the firing line or operational during instructional time. All firearms must arrive on the firing line cased. The muzzle must be pointed down range when you open your gun case. All firearms must leave the firing line unloaded and cased. Follow all instructions from the Rangemaster/Range Control Officer &/or member(s) of the instructional/coaching staff. Air quality on indoor ranges has and will continue to be a high priority and concern to all professional firearm instructors and range owner/operators. Lead dust, ingested through the nose &/or the mouth can cause serious health problems up to and including death. In Illinois, youth with lead levels of 5+ and adults with levels of 10+ have reached their “maximum level” and are now considered moving into the “at risk” category. Contact a Toxicologist (M.D.) ASAP. An annual lead level test is required for each of our precision pistol athletes . . . . . usually done at their annual school physical time. As a professional firearms instructor teaching in the academic, professional, and athlete development fields, for over 67 years, my first concern is for the health and safety of the student that relies on my knowledge and judgement in my field. OSHA will no longer allow commercial ranges to just flush the ranges with fresh air and blow the lead dust out into the atmosphere. The lead dust must be captured in some form of filtration and disposed of acording to federal guidelines. A very time consuming and expensive process. A word of caution: No commercial mask/filter product(s) will give you a 100% protection guarantee against lead poisoning. Your BEST decision is to remove yourself, and/or others, from the toxic source.